Reconnaissance Map of the Lower Saranac Lake with sketch of the Adjacent Waters. 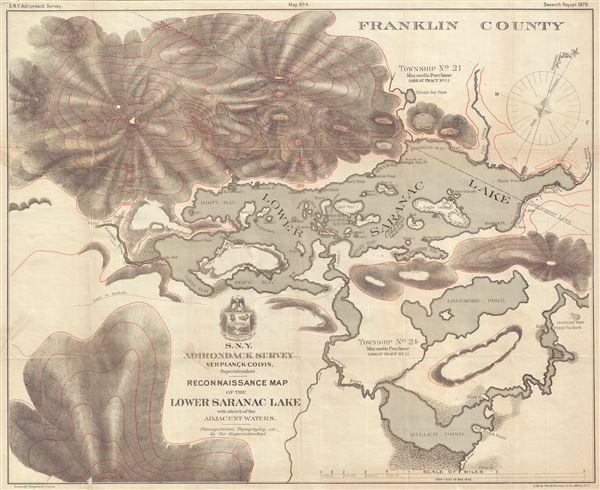 This is a fine 1879 reconnaissance map of the Lower Saranac Lake by Verplanck Colvin. It covers from Boot Bay Mountain south to Ampersand Mountains and Millers Pond (modern day Oseetah Lake). The map notes several bays, islands, townships, creeks and other landmarks in the area. Lonesome Pond (now Kiwassa Lake) is also noted. Relief is shown by contours, hachures and spot heights. The map was engraved by Weed, Parsons and Company, Albany N.Y. and drawn by Verplanck Colvin, superintendent, S.N.Y. Adirondack Survey. Triangulation, topography etc. is also done by Verplanck Colvin. Issued as Map no. 4 in the Seventh Annual Report on Progress of the Topographical Survey of the Adirondack Region of New York. Seventh Annual Report on Progress of the Topographical Survey of the Adirondack Region of New York, (Albany, State of New York) 1879. Very good. Some wear and verso repair near original fold lines. Some edge wear. Minor toning. Professionally flattened and backed with archival tissue.